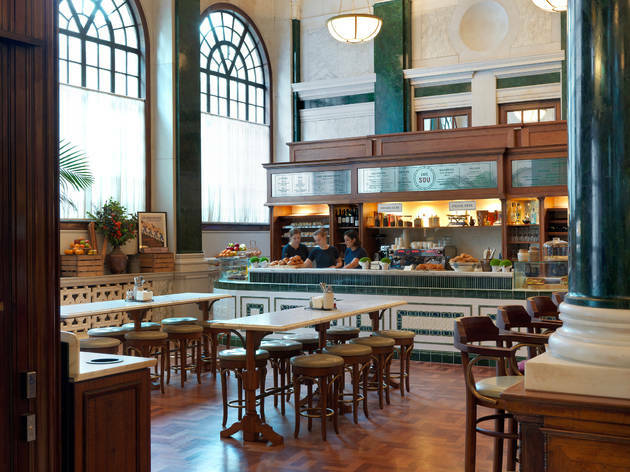 A plush Parisian-style café at The Ned. 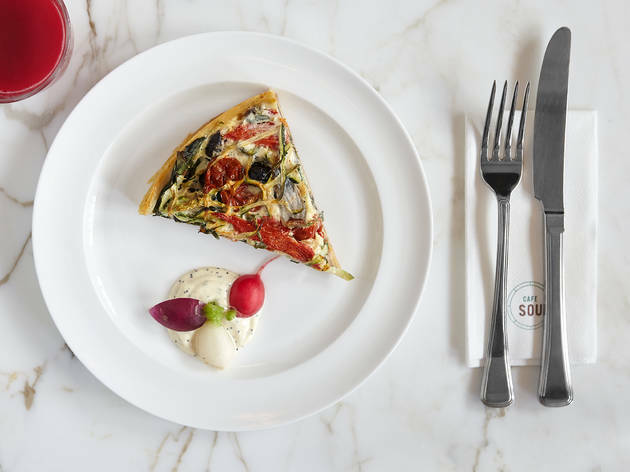 Sat at the far end of one of the The Ned’s gargantuan indoor boulevards, Café Sou is its least formal foodie offering: the Soho House Group’s attempt at a grand railway café in the Parisian mould. Très jolie it is too. The simple menu includes baguettes, quiches, omelettes, rillettes and a few salads, plus some decent wines for lunchtime lushes like me. A mound of duck rillettes was good: black-hole dense and cool with fat, the orange preserve it came with a floral stunner. 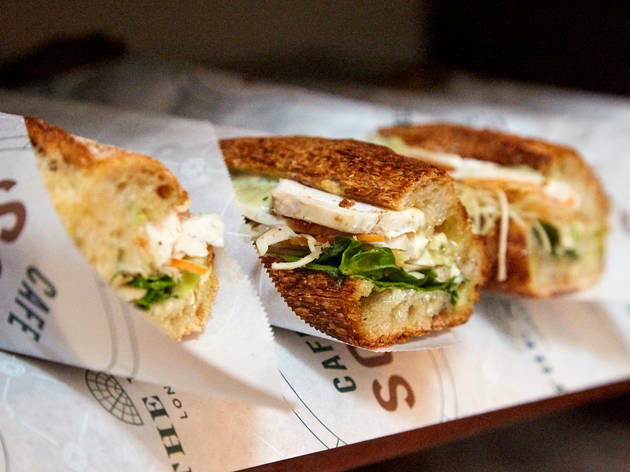 Chewy, sourdough-style baguettes were finer still, especially one filled with meaty tuna, singing of the sea but dragged flapping on to land with chopped boiled eggs and sharp vinaigrette: the kind of sandwich that reminds you why people LOVE sandwiches. The apex? A massive slab of quiche Lorraine (the cheesy, meaty Sun King of quiches), juddering with eggy texture and easily the best savoury pastry I’ve eaten outside of, well, a railway café in France. Picnic fodder? This one was on another level entirely. And it was only £4. This is still recognisably ‘café’ territory, however grand the surroundings: the high stools are only just comfy, and we were in and out in 40 minutes. 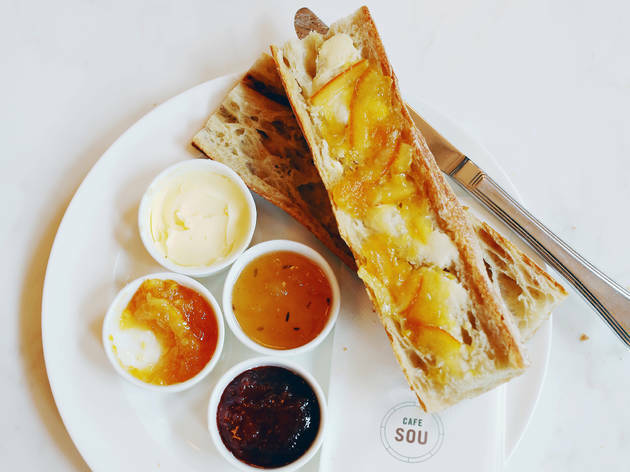 But for swiftly sensational nosh in the City, Café Sou is hard to beat. 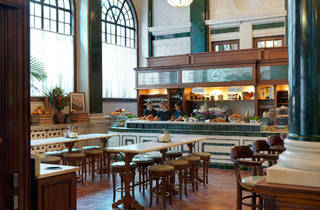 Lunch for two with drinks (no service): around £35. If you want a slightly less intimidating introduction to dining at The Ned, Cafe Sou is it. 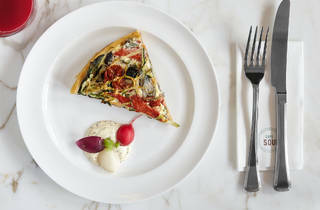 It has a simple, unpretentious menu, and isn't horrendously expensive, making it a good shout for a casual brunch or lunch - I met a friend there for an early lunch, and we were both really happy. Unlike the other options in The Ned's epic central space, you don't book for Cafe Sou, so it is possible, at certain times, to just walk up and get seated straight away.